Since oxidative stress is an intrinsic part of cell inflammation, it is reported that there is a link between oxidative stress and inflammation. It is considered as the compromised capability of cells/tissues to neutralize the effect of overproduced reactive oxygen, reactive nitrogen, and other related radicals. These reactive species and radicals cause cytotoxicity, genotoxicity, and chromosomal aberration, which lead to several diseases such as cancer and neurodegenerative diseases. In order to estimate the amount of oxidative stress, several biomarkers have been identified, including glutathione, cysteine, 3-nitrotyrosine, cellular peroxide level, the extent of lipid peroxidation and C-reactive proteins, etc. Although these and other oxidative stress biomarkers are identified, but the adequate methods of detection and quantification at the early stage and with lower biomarker concentrations are limited. Gold nanoparticle-based assays and nanosensors are being used to enhance the potential of disease diagnostics at an early stage. The intrinsic properties of gold nanoparticles, such as plasmonic resonance energy transfer, shape- and size-dependent visible and near-infrared region absorbance and fluorescence, etc., have been used for the construction of sensitive methods of oxidative stress. 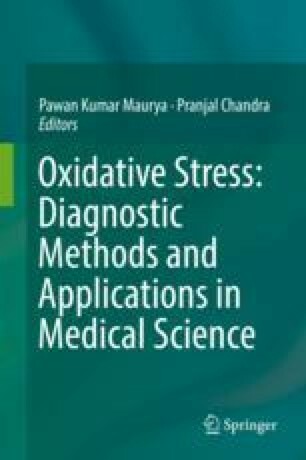 This chapter comprehensively summarizes the oxidative stress biomarkers and their method of detection using gold nanoparticles. The financial assistance for the Centre for Nanotechnology Research and Applications (CENTRA) by the Gujarat Institute of Chemical Technology (GICT) is acknowledged. The funding from the Department of Science and Technology – Science and Engineering Research Board (SERB) (Grant No. : ILS/SERB/2015-16/01) to Dr. Sanjay Singh under the scheme of Start-Up Research Grant (Young Scientists) in Life Sciences is also gratefully acknowledged. This manuscript carries a DBLS communication number DBLS-074. Pandey PC, Pandey G, Narayan RJ. Controlled synthesis of polyethylenimine coated gold nanoparticles: application in glutathione sensing and nucleotide delivery. J Biomed Mater Res. 2016; doi: 10.1002/jbm.b.33647.